Adopted on July 24, 1913, the Delaware state flag features a background of colonial blue surrounding a diamond of buff color in which the coat of arms of the state is placed. 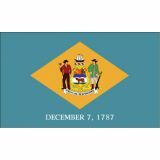 The words "December 7, 1787" reference the day on which Delaware became the first state to ratify the United States constitution. The words in the banner that read Liberty and Independence honor our revolutionary War Soldiers. 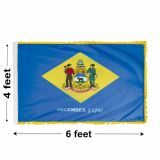 As one of the leading online vendors of Delaware Flags, Tuff Flags offer both indoor and outdoor flags that combine both excellent durability and beauty. We also have heavy oak indoor flag kit, which will have everything you may need to set up an impressive flag display quickly. Be it our ornaments, gold tassels, or flagpoles, our exquisite flag kits will make your flag presentation truly impressive. Shop from our complete line of Connecticut Flags right away and get the best prices, quick shipping, and much more! 100% customer satisfaction guaranteed! Tuff Flags has a sizeable collection of Delaware State flags in various sizes including 3’x5’,4’x6’, 5’x8’ 6’x10’, and 8’ x12’ and in two different material choices of nylon and polyester. 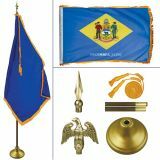 Made to the highest standards, our premium quality nylon Delaware flags are durable and beautiful alike. Finished with a strong heading and 2 brass grommets, our flags will look great both outdoors and indoors. Our 100% made in USA flags are made up of industrial quality and come with 6 months guarantee on construction. If you are looking for a flag to fly on a daily basis, your search will end in our well stocked stores. We also have 2-Ply Polyester outdoor flags that are designed to bear the elements with ease. They are great for high wind areas and daily use. Browse our collection Delaware Flags and choose a model that matches your need. Need tips? Call us at our toll free number (888) 287-3524 or email us at customercare@tuffflags.com and we can help you find the most appropriate flag model for you.